Having walked out on his first wife, Tonje, he’s decided that what he needs to kickstart his life, and his writing, is a new start in a new country. “After we parted company and I was trudging up the hills to my bedsit in Mariaberget I realised two things. The first was that I wanted to see her again as soon as possible. The second was that was where I had to go, to what I had seen that evening. Nothing else was good enough, nothing else did it. That was where I had to go, to the essence, to the inner core of human existence. If it took forty years, so be it, it took forty years. But I should never lose sight of it, never forget it, that was where I was going. 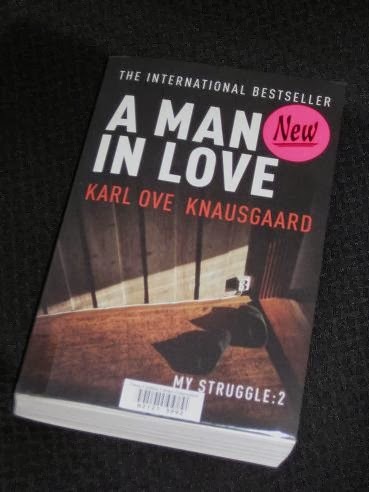 In terms of plot, A Man in Love is the story of how Knausgaard fell in love with Linda, and the progress the two make from friends to lovers to married with children; of course, that plot could be written in twenty pages. However, this is Knausgaard we’re talking about, a man who (as a friend jokes) could write ten pages about going to the toilet and make it fascinating. The book contains the usual minute detail, descriptions of absolutely everything that happens in his life. Stories branch off into other stories, one memory leads to another. Somehow, it all works. On one level, it’s the story of a man looking for his place in society and life. The writer is a foreigner, a boorish, drunken Norwegian in a land of mineral-water-sipping health freaks. In a country where everything is done by the book, and where, instead of sweets, veggies are served at kids’ parties, the chaotic, confused Knausgaard feels even more adrift than he did back home. He’s made to feel low-class and provincial, and his new start threatens to turn sour. One name that gets bandied about frequently when discussion turns to Knausgaard is that of Proust, and there seem to be two opposing camps here. The first, mainly consisting of publishers and blurb writers, is effusive in its Proustian comparisons; the second, comprising critics and grumpy bloggers, slams this as a lazy comparison. Personally, I’m somewhere in the middle (sitting on the fence, picking out splinters). Language-wise, there’s absolutely no comparison. Knausgaard uses fairly ordinary language, and he rarely sweeps the reader away by force of expression or beautiful Proustian imagery. Story-wise though, they are definitely more similar. Knausgaard’s style of slowly, laboriously describing events is obviously Proustian, but there’s also a sense of Proust’s handling of memory, with recounts going off at tangents, and smells and images evoking long-forgotten memories. Admittedly though, there are probably better comparisons out there – just ones I haven’t encountered yet. A Man in Love is a little different to A Death in the Family. It seems even more internal, reflective, and self-flagellating, and there is a deeper sense of something amiss, the writer’s madness bubbling to the surface. Linda herself has a mental illness, and Knausgaard’s first attempt to attract Linda’s attention, an attempt which ends in a bloody, stunning mess, shows that the writer has (how can I put this tactfully…) ‘issues’. It’s painful to read at times, incredibly close to the bone, and this is the genius of Knausgaard, his ability to say the unsayable, the unthinkable… I. COULD. NOT. DO. THIS. (never – not even in my head). It is interesting to read your take on this one. I've read about 100 pages and am thinking about abandoning it. I find it lighter and less interesting than the first book and think the writing quality has also taken a nose dive. Perhaps you're right – perhaps you do have to be male to really appreciate it? Your review made me curious about this book (although I'd read much about the author and the 'scandal' he provoked in Norway), so I'm reading it now. It's made me think… a lot… and I'll be posting some of my thoughts (from a feminine point of view) shortly. You've only got yourself to blame, Tony!